Dangerous Road conditions Do Not Attempt to come up to the Farm. Freezing rain solid ice. Closed for the season. G’s Trees is open in Chattaroy. Welcome to Holly Lane Tree Farm! 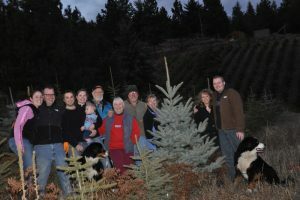 Holly Lane Tree Farm is a family owned u-cut Christmas Tree farm in the Foothills area of Mt. Spokane. Our endeavor started in March 2001 and has continued to grow and develop over the years. When you arrive at Holly Lane Tree Farm, expect a warm greeting, a complimentary cup of your favorite hot beverage and a bottle of water for the trek out to the field. Of course we’ll also provide you with a sharp saw to cut your tree and a measuring pole to check the size. We also have a light-weight tarp to help keep you dry when cutting your tree . While all trees are priced the same, they look a lot smaller in the field than they actually are! Once you’ve cut your tree, carry it to the nearest road and we’ll transport it up from the field. If you are not up to cutting and moving your tree, we’d be happy to do it for you. Once you’re done in the field, you can get warm by the fire, peruse our gift shop or grab a hot beverage and watch us shake and bale your tree. First tree cut from the farm. 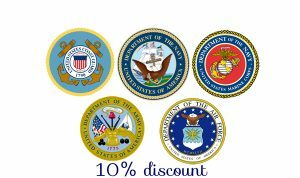 Purchase a tree and wreath or swag or garland and receive $10 off.